I have downloaded and listen to this album just the once. 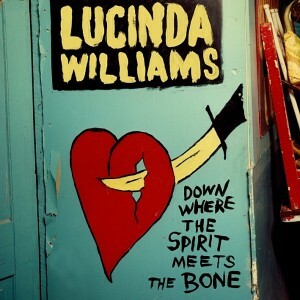 I have read quite a bit about this latest gem from Lucinda but was prevented from listening to it earlier due to some international travel and an online problem I was experiencing. But all this was solved at last this afternoon and I have been sitting here, with headphones on, making my way through this wonderful album. If you have not already gathered, this is a great album. Be aware that I have been a fan of Lucinda Williams’ music for many years now and till this album appeared I would have listed WEST as her best – although several others remain right up there alongside it. Her music is rather difficult to categories and on this album it floats somewhere between country rock, americana, rock and roll with a heavy touch of the blues. I also note the sounds of Tony Joe White on the track West Memphis. A full review will have to follow – one day. However I must join with other reviewers in raving about this music. And I must also make mention of her special cover version of the J J Cale song, Magnolia – a great tribute to a special musician who we lost last year. Here’s a very nice YouTube short studio version of West Memphis which is one of many highlights from Down Where The Spirit Meets The Bone.